We have new daily record highs at most all of the major observations stations. A cold front will pass through tonight, putting an end to the spring-like warmth. A few showers will accompany the front, but rain amounts will be fairly light, and there is no risk of severe thunderstorms. Tomorrow will be partly sunny, windy, and much colder with a high in the 47-50 degree range. A north wind of 12-22 mph will make it feel colder. 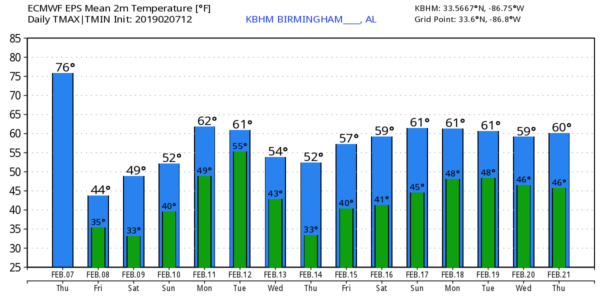 THE ALABAMA WEEKEND: Saturday morning will feature a freeze; with a clear and and light wind we start the day in the mid 20s. Then, the high Saturday afternoon will be in the mid 50s with a partly sunny sky. Clouds will increase Sunday, but most of the day will be dry with just a few isolated showers by mid to late afternoon over the northern counties of the state. Sunday’s high will be in the 57-60 degree range, very close to seasonal averages for mid-February. NEXT WEEK: Monday will be a mostly cloudy and mild with with a few showers possible over the northern quarter of the state; the afernoon high will be in the mid to upper 60s. Then, on Tuesday, showers and a few thunderstorms are likely ahead of an approaching cold front. The latest global models suggest severe storms should not be an issue… then cooler, drier air follows on Wednesday with a partly sunny sky along with a high in the 50s. Thursday and Friday look cool and dry. See the Weather Xtreme video for maps, graphics, and more details. ON THIS DATE IN 1835: A great freeze took place from February 2-9 across southern Georgia, southeastern South Carolina, and northern Florida. During this freeze, the St. Johns River was frozen, “several rods from the shore,” and people were able to walk a distance from the shore. Many citruses and other fruit trees were killed to the ground, never to grow again, when temperatures reached as low as 1ºF in Charleston and 8ºF in Jacksonville. A Florida gentleman told a newspaper that the state, “appeared as desolate as if a fire had swept over it,” after the severe freeze of that winter season.